When director Julius Avery was a boy, his grandfather used to show him medals, disarmed grenades, and bullets he kept from his time serving in the North African campaign during World War II. As a movie-obsessed kid, he was completely fixated by his granddad's stories and his photo albums, which transported him to a different era. 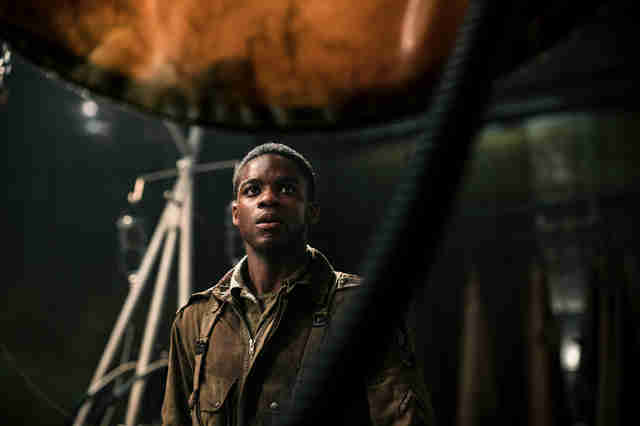 When he became a filmmaker, he knew he wanted to make a war movie one day, but he had no idea it would be a completely bonkers one like Overlord, his new J.J. Abrams-produced combat-horror movie. 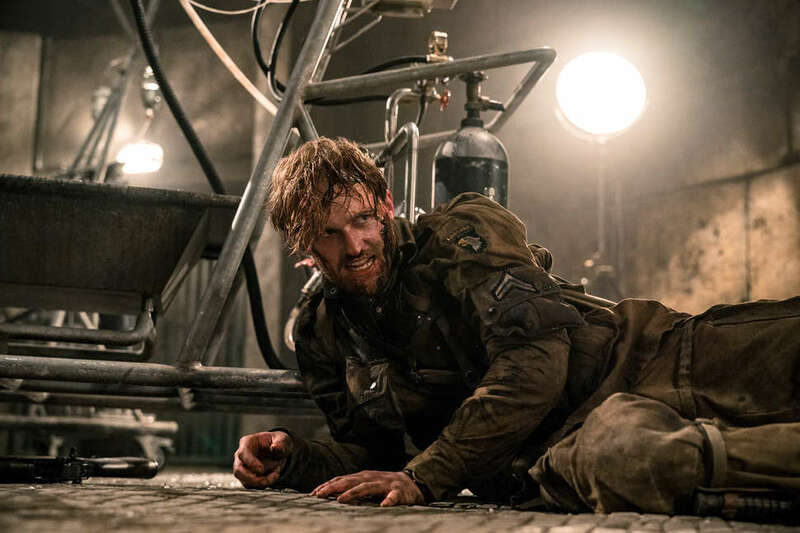 By splicing together men-on-a-mission war movies with the splatter-filled carnage of a first-person shooter, Overlord feels like the result of a lab experiment gone haywire. 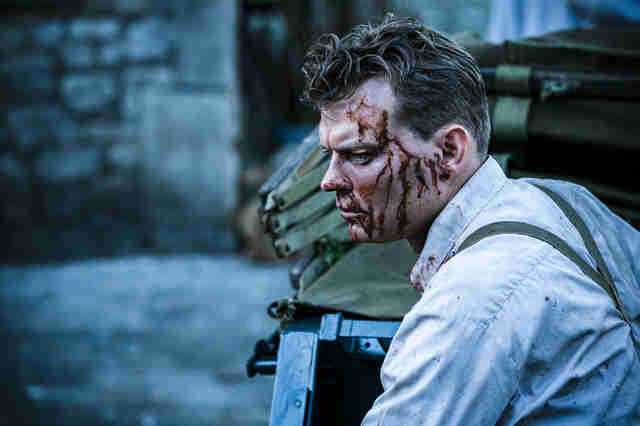 From its gripping opening sequence, which finds nervous recruit Private Ed Boyce (Jovan Adepo) getting ready to leap from a plane before getting sucked out into the air, to its flame-kissed finale, where a severely disfigured Nazi captain (Pilou Asbæk) does battle with a wild-eyed paratrooper (Wyatt Russell), the movie doesn't pause to dwell on the tangled secrets of its alternate-history setup or the nitty-gritty details of its gruesome pulp plot. Instead, Avery keeps his foot on the gas. On the phone from California the day of the film's release, the chatty Australian said he wanted to make a movie best dissected over a giant plate of nachos afterwards. In that spirit, we asked him to break down some of Overlord's wildest moments, creepiest sights, and lingering questions. Provide your own nachos. How does the super-soldier serum work? One thing that becomes completely clear as you watch Overlord: This is not a zombie movie. (It's also not a part of the Cloverfield universe as originally rumored.) The monster-like humans shown in the trailer are not conventional zombies that have risen from their graves to feast on brains; these are humans who have been injected with a Nazi-scientist-concocted serum that turns them into ruthless killing machines. "Even in the development stage and leading to the shooting, we never called them zombies," says Avery. "We always called them super-soldiers. Even though there's a lot of testing and one or two rejects -- and I think we even called one of them 'a mistake' -- they're not trying to create mindless, flesh-eating creatures. They're trying to create an unstoppable army." Avery compares the research project, which Boyce stumbles onto in the film, to the Manhattan Project. How exactly is the serum, a reddish liquid we see in syringes throughout the film, created? 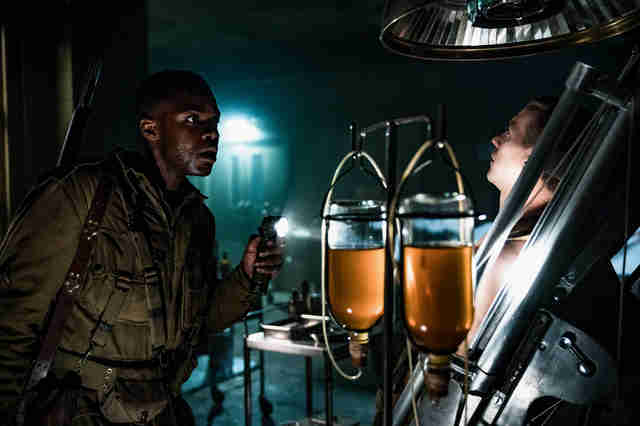 During the scene where Boyce explores the lab, he finds his fellow paratrooper Tibbet (John Magaro) hooked up to a suspicious-looking machine, and while you might think he'll suddenly transform into super-soldier later in the film, he ends up being fine. Was he being harvested? Readied for some other terrifying treatment? Just poked for the hell of it? "What they're doing is they're preparing to put him in one of those bags, and you see that in the trailer, there's a guy in the bags," explains Avery. "They use the people and put them in the bags, and it's part of the process. They're pumping the people full of stuff, and then stuff comes out of them, and that's the serum. It's kinda like a strange filtration system." Once the "strange filtration system" process is complete? Voilà, you've got a super-soldier serum. What was going on with that creepy bag? The strange filtration system is reliant on the aforementioned scary-looking bag, which Boyce unzips in one of the movie's most unsettling moments. The bags are essentially collecting the serum, which is being secreted by the people trapped in the bags. It's really gross, but, according to Avery, it's also meant to tie back to the image of Boyce almost drowning and cutting his way out of his parachute during the film's opening. The bag wasn't just disturbing in the film; it was also disturbing on set. "We put a stunt guy in there," says Avery. "And he freaked out to the point where he was like, 'I'm done. I'm not going back in that thing. It is too scary.' We filled it full of all this goo and liquid and stuff, and he said, 'You can set me on fire, throw me out of a car, but I'm not going back in that thing.'" Ultimately, they had to find another stunt man to go climb into the sleeping bag from hell. "I get it!" says Avery. "I wouldn't go in that thing, right? We tried to keep everything in camera and as practical as we could to give everything a sense of tactile reality. The bags were just so gross." Was the big flamethrower showdown a tribute to Aliens? 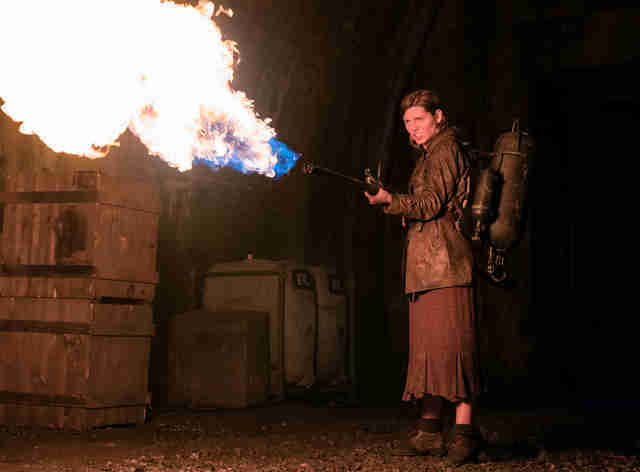 One of Overlord's best moments involves Mathilde Ollivier's Chloe, a concerned French civilian caught up in the conflict, picking up a flamethrower and unleashing hell on one of her undead attackers. It's an eyebrow-singeing image, and it might remind you of Sigourney Weaver's similarly heated confrontation with a hideous monster in James Cameron's 1986 science-fiction opus Aliens. Avery describes the scene as an "unconscious Easter Egg" that comes from a lifetime of movie-watching. When asked about the moment, Avery is quick to credit his love for the R-rated action extravaganzas he gobbled up as a kid in the '80s, including Aliens and The Thing, which starred Kurt Russell, the father of Overlord's Wyatt Russell. (Overlord's tense standoffs share some DNA with John Carpenter's genre-bending classic.) Avery wanted Overlord to have a few of those moments that would take viewers right back to childhoods spent poring over VHS tapes. To evoke that tactile quality of the movies he grew up on, Avery also attempted to use as many practical effects as he could, relying on special-effects makeup, real props, and puppetry rather than CG and green screens whenever he could. "For the flamethrower, for instance, yeah, we could've done that without that flamethrower," he says. "We could've put it all in post. But there's nothing like an actor feeling the heat of that machine. If you accidentally put your hand in front of that, you'd be going to the hospital. It's a real thing. An actor doesn't have to act it -- they feel it." Will there be an Overlord sequel in the future? Instead of one final scare or a post-credits teaser, we're left with a sense of Indiana Jones-like possibility about the future, which is how Avery wanted the ending to play. "It was always meant to be a stand-alone," he says. "That's all out of your hands anyway as a filmmaker. That's what studios do: If something hits it, they've got the intellectual property and they can do whatever the hell they want with it. They can make a sequel, reboot, rehash, whatever they want." Still, that doesn't mean Avery hasn't thought a little bit about what another movie in the Overlord universe could be. He explains he wanted the movie to give you 90 percent of "everything you want" but then leave you wanting that last 10 percent. He's curious what an Overlord version of the Battle of the Bulge might look like, but acknowledges, "maybe that could be in the audience's mind and not the filmmakers." Something to argue about over your nachos.